Charles of Blois-Châtillon (1319 – 29 September 1364) "the Saint", was the legalist Duke of Brittany from 1341 to his death via his marriage to Joan of Penthiève, holding the title against the claims of John of Montfort. He was later canonized as a Saint of the Roman Catholic Church for his devotion to religion. This canonization was later annulled, although he remains beatified. Charles was born in Blois, son of Guy de Châtillon, count of Blois, by Margaret of Valois, a sister of king Philip VI of France. An devout ascetic from an early age, he showed interest in religious books but was forbidden from reading them by his father, as they did not seem appropriate to his position as a knight. As he grew older, Charles took piety to the extreme of mortifying his own flesh. It is said that he placed pebbles in his shoes, wore ropes tight with knots near his flesh, slept on straw instead of a bed, confessed every night in fear of sleeping in a state of sin, and wore a cilice under his armor in battle. He was nevertheless an accomplished military leader, who inspired loyalty by his religious fervour. On 4 June 1337 in Paris, he married Joanna of Penthièvre, heiress and niece of duke John III. Together, Charles and Joanna de Châtillon fought the House of Montfort in the Breton War of Succession (1341–1364), with the support of the crown of France. Despite his piety, Charles did not hesitate in ordering the massacre of 1400 civilians after the siege of Quimper. After initial successes, Charles was taken prisoner by the English in 1347. His official captor was Thomas Dagworth. He stayed nine years as prisoner in the Kingdom of England. During that time, he used to visit English graveyards, where he prayed and recited Psalm 130 much to the chagrin of his own squire. When Charles asked the squire to take part in the prayer, the younger man refused, saying that the men who were buried at the English graveyards had killed his parents and friends and burned their houses. Charles was released against a ransom of about half a million écus in 1356. Upon returning to France, he decided to travel barefoot in winter from La Roche-Derrien to Tréguier Cathedral out of devotion to Saint Ivo of Kermartin. When the common people heard of his plan, they placed straw and blankets on the street, but Charles promptly took another way. His feet became so sore that he could not walk for 15 weeks. He then resumed the war against the Montforts. Charles was eventually killed in combat during the Battle of Auray in 1364, which with the second treaty of Guerande in 1381, determined the end of the Breton War of Succession as a victory for the Montforts. According to Froissart's Chronicles, Charles also had an illegitimate child, John of Blois, who died in the Battle of Auray. Considering Charles' extreme piety, historian Johan Huizinga regarded it unlikely that Charles actually had a child born outside marriage and that Jean Froissart was probably mistaken in identifying John as Charles' son. After his death, his family successfully lobbied for his canonization as a Saint of the Roman Catholic church for his devotion to religion. The canonization process was nullified by Pope Gregory XI at the request of Duke John IV of Brittany, Charles' final opponent in the Breton War of Succession and the recognized Duke of Brittany under the first Treaty of Guerande. Battle of Auray 1364, "Chroniques"
^ a b c d e f g Huizinga (2016), p. 289. ^ a b c Huizinga (2016), p. 290. ^ Prestwich 1993, p. 174. ^ Sumption 1999, p. 434. ^ Jones 1988, p. 265. ^ a b c Autrand 2000, p. 441. ^ Bruel 1905, p. 198. Autrand, Francoise (2000). "France under Charles V and Charles VI". In Jones, Michael (ed.). The New Cambridge Medieval History: Volume 6, C.1300-c.1415. Cambridge University Press. Bruel, François-L. (1905). "Inventaire de meubles et de titres trouvés au château de Josselin à la mort du connétable de Clisson (1407)". Bibliothèque de l'École des chartes. Librairie Droz (66). Huizinga, Johan (2016) [1st pub. 1919]. Herbst des Mittelalters [The Autumn of the Middle Ages] (in German). Translated by Kurt Köster (4th ed.). Stuttgart: Reclam. ISBN 978-3-15-020366-8. Jones, Michael (1988). Creation of Brittany: A Late Medieval State. The Hambledon Press. Prestwich, Michael (1993). The Three Edwards: War and State in England, 1272-1377. Routledge. Sumption, Jonathan (1999). The Hundred Years War, Volume 1: Trial by Battle. Faber & Faber. Wikisource has the text of the 1911 Encyclopædia Britannica article Charles (Duke of Brittany). "Charles de Blois" . The American Cyclopædia. 1879. The Combat of the Thirty was an episode in the Breton War of Succession fought to determine who would rule the Duchy of Brittany. 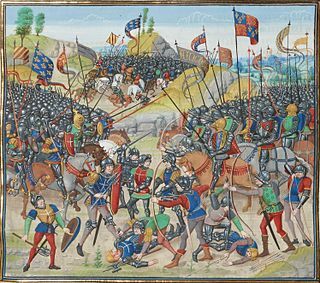 It was an arranged fight between picked combatants from both sides of the conflict, fought at a site midway between the Breton castles of Josselin and Ploërmel among 30 champions, knights, and squires on each side. 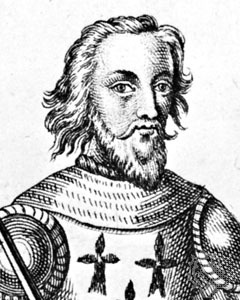 The challenge was issued by Jean de Beaumanoir, a captain of Charles of Blois supported by King Philip VI of France, to Robert Bemborough, a captain of Jean de Montfort supported by Edward III of England. The House of Dreux was a cadet branch of the Capetian dynasty. It was founded by Robert I, Count of Dreux, a son of Louis VI of France, who was given the County of Dreux as his appanage. La Roche-Bernard is a commune in the Morbihan department of Brittany in north-western France. Inhabitants of La Roche-Bernard are called in French Rochois for men and Rochoises for women. The House of Châtillon was a notable French family, with origins in the 9th century and surviving until 1762. The name comes from that of Châtillon-sur-Marne in Champagne, where members of the family were tenants in a castle belonging to the Counts of Champagne. Gaucher V of Châtillon was lord of Châtillon from 1290 until 1303, when he became count of Porcien; the title was sold to Louis of Valois, Duke of Orléans in 1400. Other branches of the family were in Saint-Pol-sur-Ternoise, in Blois, and in Penthièvre.